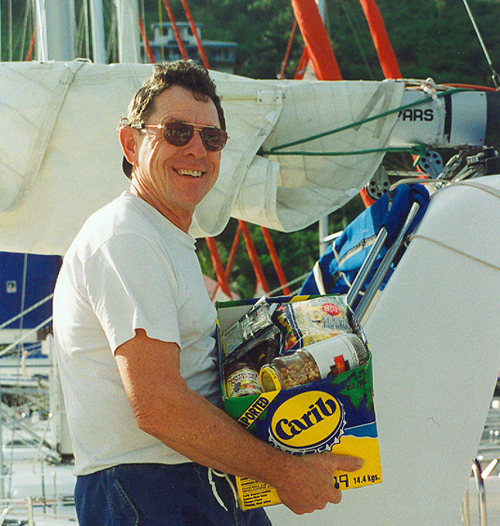 By Carolyn Shearlock, author of The Boat Galley, with over 350 FREE articles to get the most out of your boat kitchen with galley tips, insights & equipment recommendations. A few recipes, too - plus an active Facebook community to ask questions and share tips with other readers! The Boat Galley Cookbook, written with Jan Irons, is now available at Amazon and other retailers. 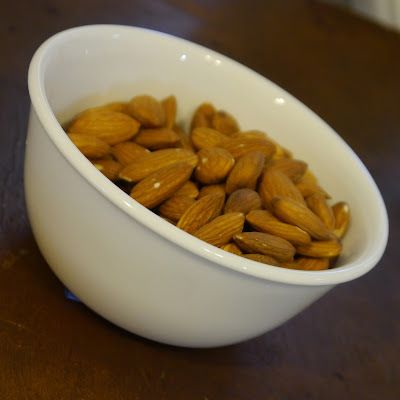 Hate stale chips and cookies? 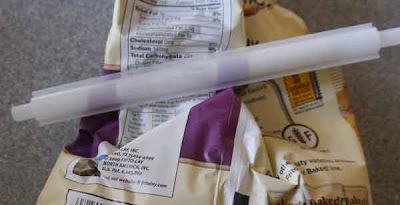 Do you end up putting everything in airtight plastic canisters? A friend recently told me of an easier way to keep them fresh! 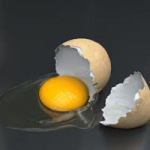 There's an old saying that if you are making an omelet, you've got to break a few eggs. Well, I'll change that to say that if you have eggs on a boat, you're going to break a few. And not just into the pan or bowl where you want them. A fun time to share a cocktail or two with friends. 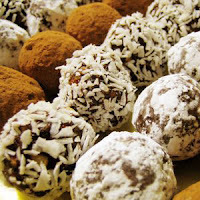 "Booze Balls" were traditional holiday treats in my family, and I love them (we'd make "No-Booze Balls" with orange juice for the kids). When we began living aboard, I decided they were great as they didn't need to be baked... then I discovered an easier way to make them by pressing the mixture into a pan and cutting instead of rolling each one separately. Perfect for days when you want a treat, but don't feel like devoting the whole day to baking! It's hard to believe that this is our 3rd annual holiday gift guide, with a large selection of nautical gift ideas for the boating enthusiasts on your Christmas shopping list. This year we've got some old favorites as well as many new and unique items that you won't find anywhere but on the Daily Boater. We've included submissions from many of our partners and products we've either tested, read or worn so that you know they are gifts you could trust. Includes personalized mugs, serving trays, bottle openers, and more... GO! Includes a cookbook, a book about fishing, and the 2013 MegaYacht calendar... GO! 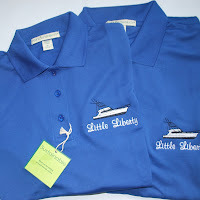 Hats, shirts, shoes - everything you need to deck out your favorite boater in style... GO! Exclusive Daily Boater discount: Remember, if you see anything you like at BoatNameGear, our readers can save an additional 15% when promo code DAILY15 is used at checkout before 12/5/12. Best of all, as a Daily Boater reader, you'll save 15% off your entire online order when promo code DAILY15 is used at checkout before 12/5/12 - only at www.BoatNameGear.com. These ceramic Boat Name coffee mugs are perfect for sipping your favorite morning beverage, on or off the boat. 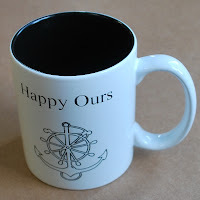 This ideal galley gift is made of a ceramic, and you can add a boat name (or any text) - laser etched above your choice of either a lighthouse or ship's wheel and anchor. Available in white, gray or red, and no minimum quantity. The Mariner makes an ideal gift for any nautical-minded foodie on your list. It is a cheese board and tool set designed to look like a ship's helm, and as you'd expect from a wheel, it spins for easy access to your favorite snack. 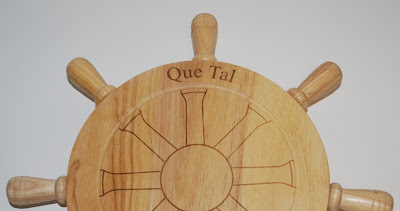 Your boat name (or any text) is engraved into the board to make this a truly unique nautical gift. Shop for the Mariner at BoatNameGear.com. If you're going to serve cheese, you might as well also serve some wine. This personalized corkscrew is a great stocking stuffer for any boat owner, or an ideal gift for any wine lover on your list. It includes a boat name (or any text) - engraved into the wooden handle. 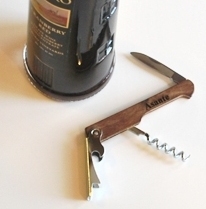 Buy this corkscrew at BoatNameGear.com. This ratchet-style bottle opener is perfect for hanging in the galley or keeping in your tool or tackle box. It is HAND POLISHED and made in the USA in the same mold that a famous tool company uses to make wrenches; but this tool is made for bottles instead of nuts and bolts. 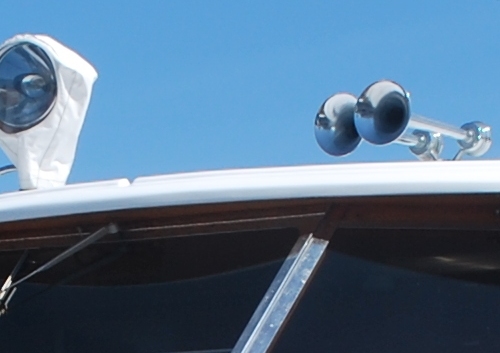 It includes a nautical design at the top, and your boat name (or any text) on the handle. Shop for the Ratchet Boat Name Bottle Opener at BoatNameGear.com. You can view additional styles of bottle openers at BoatNameGear.com, and don't forget, Daily Boater readers save 15% off their entire online order when promo code DAILY15 is used at checkout before 12/5/12. 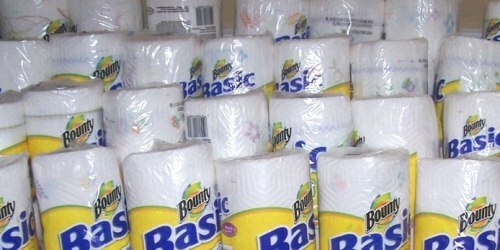 Return to the main 2012 Holiday Gift Guide. 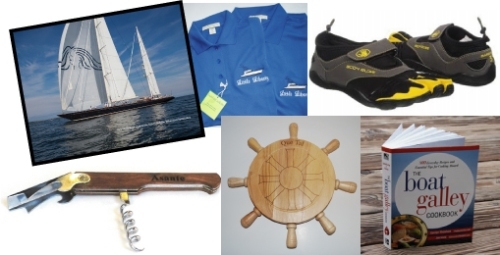 We've found a few items that boaters love to wear, on and off the boat. Some are practical, some are unique, and some can be personalized with the boat's name on them. Factoid: Studies show that wearing boating gear helps a boater get through the day when they can't be on the boat, especially in the cold winter months. 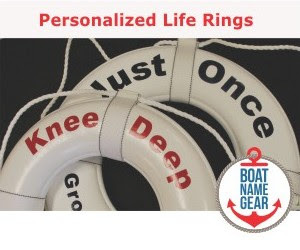 Whether you are snowed in for the winter, ice fishing, or spending a cool evening on the boat, you'll feel more comfortable when you are wearing a watch cap, subtly embroidered with your boat name on the band. Available in several colors, these personalized hats make a great gift for any boater experiencing the winter blues. Pick up a boat name watch cap for under $20 at BoatNameGear.com, where Daily Boater readers save 15% on this item when promo code DAILY15 is used at checkout before 12/5/12. Breathable and quick-drying with a unique drainage system. 3-toe design and velcro strap for easy on and off. Non-marking rubber sole that provides a great grip. Available for about $50 at famousfootwear.com. Here's a gift that can be worn all year long. This sport shirt is made from fabric incorporating fast-growing and renewable bamboo for exceptional breathability and comfort. It is UV ray resistant, helps regulate body temperature and wicks moisture so you stay dry and confident all day long. All that and includes a boat name and hailing port (or any text), embroidered on the left chest in your choice of color, at no extra charge. 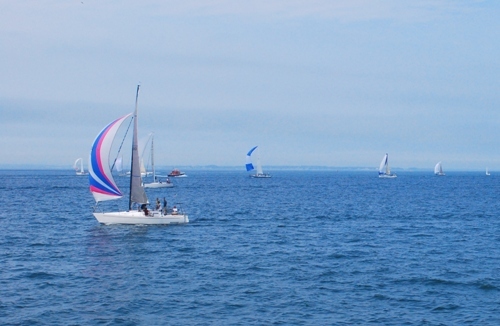 You can also add one of several stock nautical images. Available for under $50 at BoatNameGear.com, where Daily Boater readers save 15% on this item when promo code DAILY15 is used at checkout before 12/5/12. You've been reading her tips here on the Daily Boater since February, but over the past four years, Carolyn Shearlock and her good friend Jan Irons and have been writing a comprehensive cookbook for cruisers called The Boat Galley Cookbook, and it was finally published last month. The Boat Galley Cookbook is filled with the same type of detailed information that Carolyn shares in her posts here on the Daily Boater, with more than 800 everyday recipes made from obtainable ingredients without electrical appliances, plus in-depth information on unfamiliar cooking techniques, food storage, substitutions and more. 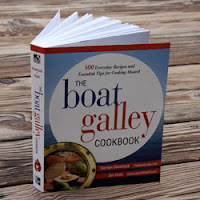 Pick up a copy of The Boat Galley Cookbook at Amazon.com. For the third year in a row, we are proud to feature the Spectacular Superyachts Calendar in our gift guide from our freinds at Megayacht News. 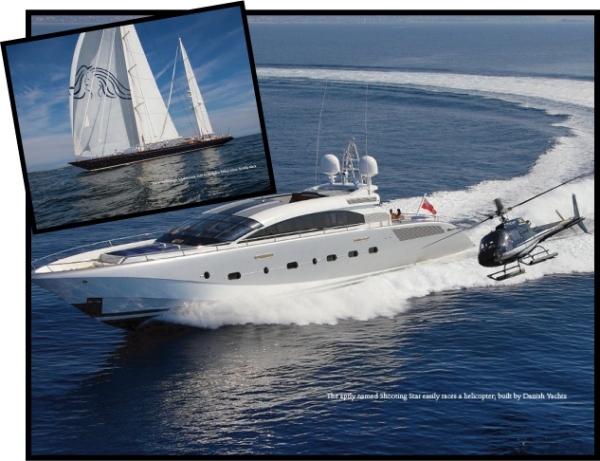 Not only does this 16 x 11 inch calendar contain beautiful pictures of the finest yachts in the world, but a portion of the sales are donated to the International SeaKeepers Society. Order your calendar today at MegaYachtNews.com. A quick and easy read, but recommended only for adults due to some of the content, including descriptions of drug use. 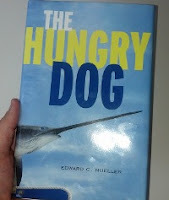 We found The Hungry Dog to be a raw and insightful look into the life of a young man from Long Island whose path lands him aboard a commercial swordfishing boat in the Windward Passage, among other places. Available at Amazon.com. 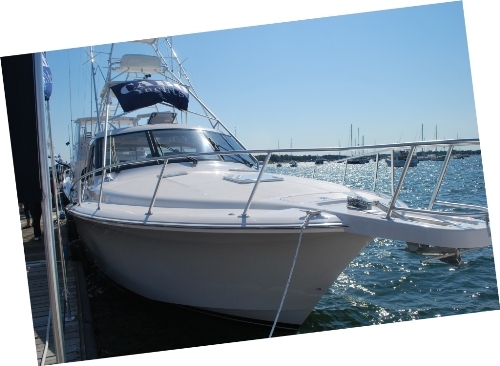 It is now estimated that more than 65,000 recreational boats were damaged or lost as a result of Hurricane Sandy according to a report released today by the Boat Owner’s Association of The United States (BoatUS). 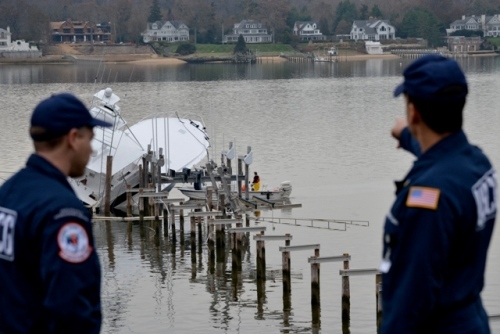 The dollar damage associated with all recreational boats from the storm is reported to be approximately $650 million, making this the single-largest industry loss since BoatUS began keeping track in 1966. 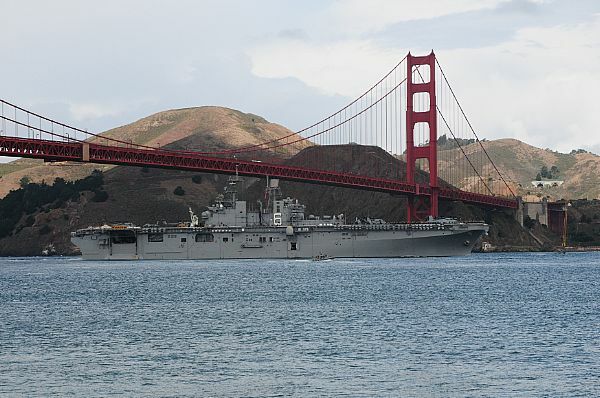 Coast Guard photo by Petty Officer 2nd Class Andy Johnson. 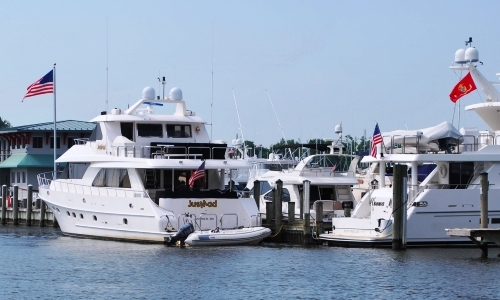 The fall boat show schedule continues plodding along with only a few boat shows scheduled for this weekend, with two events just a couple of hours away from each other on the Gulf of Mexico. 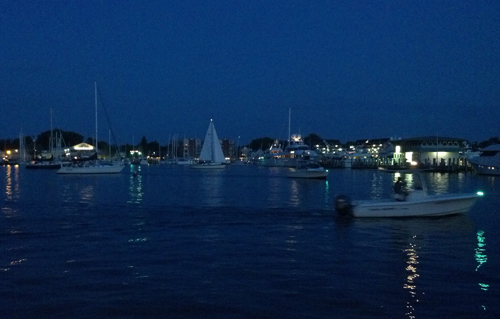 We'll review the shows after the photo below, which is a shot we took at a recent boat show in Newport, Rhode Island. 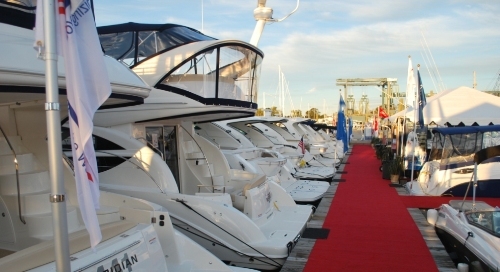 One of the reasons the boat show schedule is light this weekend is perhaps because of the federal holiday on Monday. Speaking of which, we'd like to take this opportunity to thank all the veterans who have bravely served our country. This is serious. 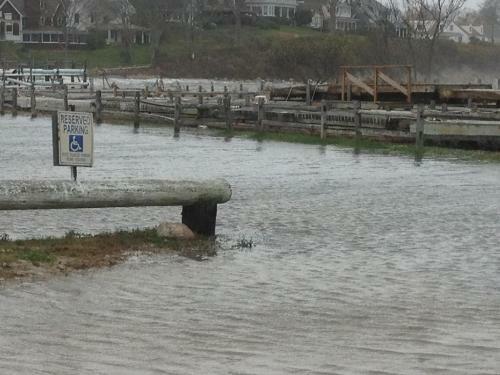 We've seen warnings over the past few days from various agencies throughout the Northeast about staying off the water. Water hazards resulting from Sandy will likely exist until next spring, especially close to shore in places like Long Island Sound. 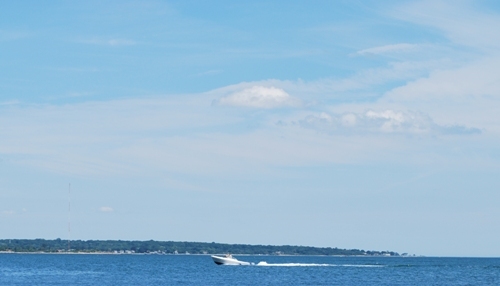 Over the weekend, the boating division of the Connecticut DEEP warned on their Facebook page that if you are planing to go out in coastal areas be aware that there is a lot of semi submerged debris. 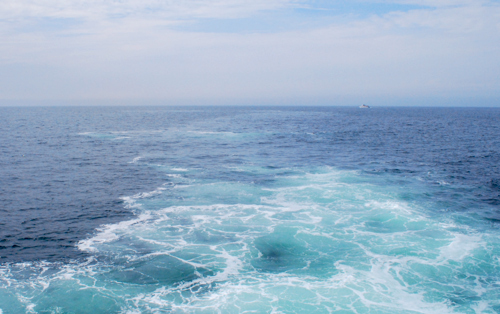 These hazards can be very difficult to see and can cause very serious damage to your vessel. As a public health and safety precaution, the New Jersey Department of Environmental Protection is advising recreational boaters, anglers and crabbers to temporarily avoid the waters of northern Barnegat Bay, from Barnegat Light to Point Pleasant, and is advising residents not to eat any fish, crustaceans or shellfish from these waters due to potential contamination from pathogens, such as bacteria and viruses. Of course, many recreational boaters in NJ, NY and New England are staying off the water anyway. The temperature has cooled dramatically, and the forecast calls for another Nor'easter on Wednesday. More importantly, a lot of us are simply still recovering and cleaning up from the devastation brought on by Sandy. But with the sun shining today and another storm on the horizon, there may be a few of you thinking about getting in one last day on the water... All we ask is that you please consider our plea if only for today. Don't boat, vote. The fall boat show schedule is slowing down with only a few boat shows scheduled for this weekend, most of which are located in places where it isn't even fall! Fort Lauderdale wrapped up this past Monday, just as Hurricane Sandy took aim on the Jersey shore. Sandy was brushing by Florida during the first two days of the show, depositing enough rain and wind in Fort Lauderdale to keep the crowds at bay, but organizers say they bounced back on Saturday. 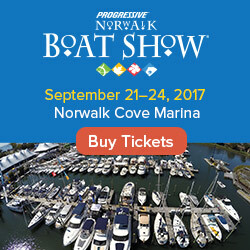 The NMMA just announced that its new 2013 Progressive Insurance Los Angeles Boat Show will return to the Los Angeles Convention Center but will also debut a new in-water location at Burton W. Chace Park in Marina del Rey Harbor. The show is scheduled for February 7-10, 2013. 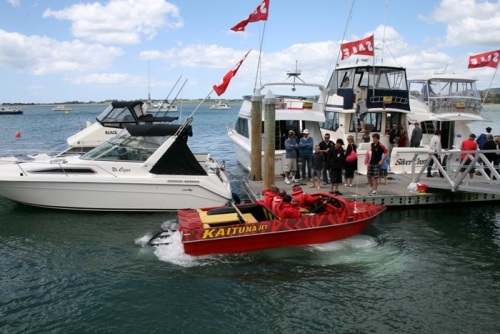 A photo from last year's Tauranga Boat Expo in New Zealand courtesy of www.boatexpo.co.nz. With the NBA season beginning this week, the World Series just concluding last week, and the NFL in its mid-season stride, the Recreational Boating & Fishing Foundation (RBFF) couldn't have picked a better time to come out with their latest graphic to promote our industry. Read on to find out how, according to the RBFF, the benefits of fishing and boating far outweigh those of football, basketball, baseball, and nearly every other sport. In fact, the RBFF says that fishing and boating are more rewarding, less expensive, more sociable, more relaxing, safer, healthier, better for the environment and more popular across all age groups than just about any recreational sport. 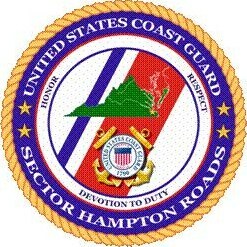 At about 10:00 am this morning we received the following announcement from the public affairs office of Coast Guard Sector Hampton Roads in Portsmouth, Virginia. The Coast Guard captain of the port has set Port Condition Zulu for the coastal waters of the eastern shore of Maryland and Virginia Saturday due to the approach of Hurricane Sandy. Condition Zulu means gale force winds are possible within 12 hours. 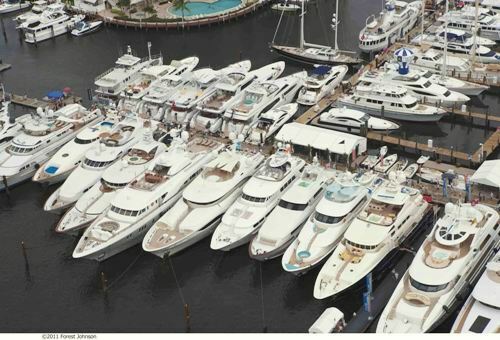 This is the weekend that boat show enthusiasts (is that a thing?) have been waiting for all year long. It's finally here. Fort Lauderdale. FLIBS starts now. The Rules for Prevention of Collision at Sea - Rules, Rules, Rules!? Are you a Do-It-Yourselfer? Trying to save a little money and winterize your 30-something foot boat all by yourself? Here's some advice... leave it to the professionals if you can. 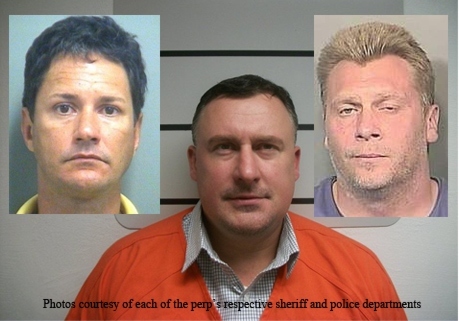 and The Voice, reported that a man started a fire on his own boat that quickly spread to three other boats - all between 30 and 40 feet long - destroying all of them and causing at least $250,000 in damages. 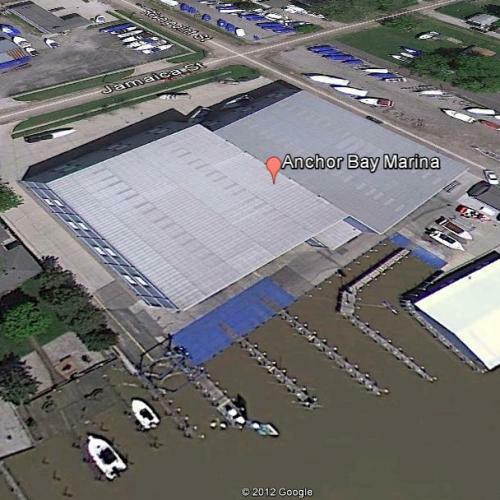 It seems the guy was shrinking the shrink wrap on his boat using a propane powered torch, and pointed the torch at one area a bit too long, igniting a blaze on his own boat, and spreading to three nearby boats at a marina in Chesterfield, Michigan. May we suggest a hair dryer next time? Luckily nobody was hurt, and hopefully insurance will cover all the damage. This just goes to show you, boating safety doesn't stop at the end of the season! 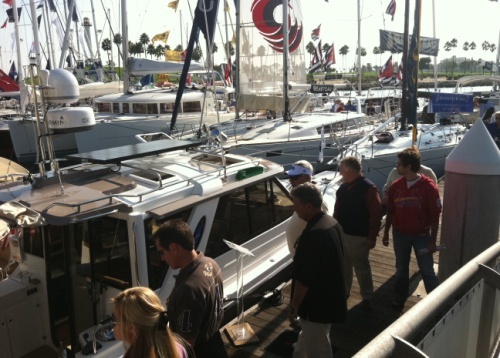 This photo from last year's Long Beach boat show was provided to us by the NMMA. The Rules for Prevention of Collision at Sea – Hey You, Over There! Help! Rules 36 (Signals to Attract Attention) and 37 (Distress Signals) are rather straight forward and don’t take up a lot of pages in the COLREGs. But, upon reflection, can there be anything more important than to be able to send signals that the receiver actually understands, especially if you are in distress…? 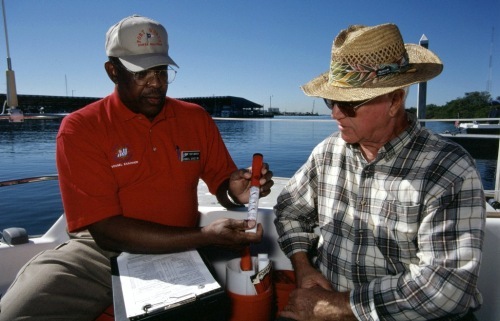 A USCG photo of a vessel examiner examining the visual distress signals as part of a safety check. By Carolyn Shearlock, author of The Boat Galley, with over 350 FREE articles to get the most out of your boat kitchen with galley tips, insights & equipment recommendations. A few recipes, too - plus an active Facebook community to ask questions and share tips with other readers! The print edition of The Boat Galley Cookbook, written with Jan Irons, is now available at Amazon. 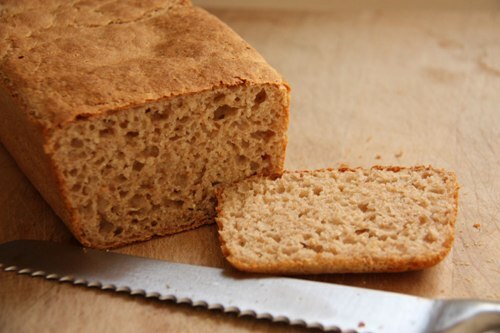 Delicious homemade bread with no kneading and ready in just an hour and a half? Even better, it tastes just like English muffins but is so much easier to make! 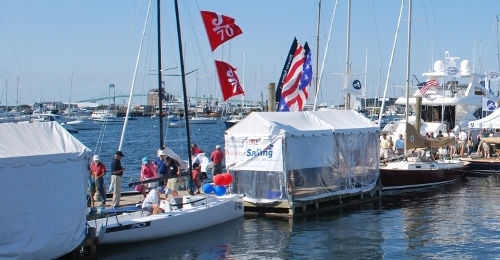 Last weekend's boat show round-up was marked by Columbus Day Weekend and big non-boat-show nautical events such as Fleet Week the America's Cup World Series. This weekend is different. This weekend is all boat shows, and they're all over the place. We just received an email from Soundings magazine, featuring a video of a boat going in circles with the throttle wide open. Unfortunately, nobody was on the boat to keep it under control, slow it down, or stop it from hitting anything. The video was uploaded to YouTube a few days ago by the RNLI (Royal National Lifeboat Institution) near Cornwall in England. Besides the dramatic headline and content of the video, it really jumped out at us because it is a perfect example of why boaters should use an automatic killswitch such as those available from one of our advertisers, Autotether. If the fisherman who was knocked off the runaway boat in this video had an Autotether, his engine would have been cut off the moment he fell out of the boat, and the RNLI wouldn't have had to risk their lives to stop the boat from potentially hurting others. 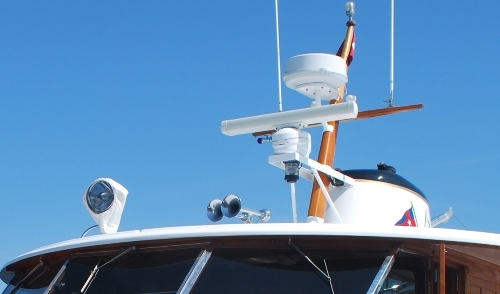 While Autotether is generous enough to advertise on our network of boating sites with banner ads, this post is not part of their package and they did not ask us to write this. We are just proud that one of our partners makes an awesome product that save lives, as well as the resources of organizations like the RNLI. More about Autotether at www.autotether.com. Hat tip to Soundings for alerting us to this video; the Soundings article also has more details on the story. You can also visit the website for the RNLI to learn more about that truly life saving organization, and if you think they are as amazing as we do in this video, consider making a donation. Thirty years ago this month, about 300 miles off of the coast of Maine, a barrage of towering, 25-foot waves battered a catamaran sailboat, causing it to begin sinking. A satellite, orbiting in space, detected the signal from an emergency beacon onboard the boat. A short while later, the US Coast Guard Cutter Vigorous, the Oil Tanker California Gerry, and the freighter Altlantic Ace were all on the scene, and the three passengers of the cat were pulled to safety. 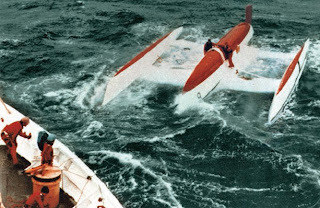 The Search and Rescue Satellite-Aided Tracking system, or Cospas-SARSAT, is celebrating the 30th anniversary of this first life-saving rescue in the United States, which occurred October 10, 1982. NOAA operates several satellites and the U.S. Mission Control Center as part of the international program that has been responsible for the rescue of more than 30,000 people worldwide and nearly 7,000 in the United States since its inception in 1982. This past Saturday, brothers Mike and Donald Bramlett, both in their early 50's, set off from Ocean City en route to Chincoteague, Virginia, aboard their 38 foot cruiser. They should have arrived by Saturday evening. Come'on boaters, we can do better than this. And not just in Florida, but all over the country. A recent article from firstcoastnews.com points out that in 2012, "41 people have died in boating accidents across Florida. That's down from 49 deaths through the same period last year." Not a bad improvement, but as the article points out, Florida is still the perennial leader in boating deaths. 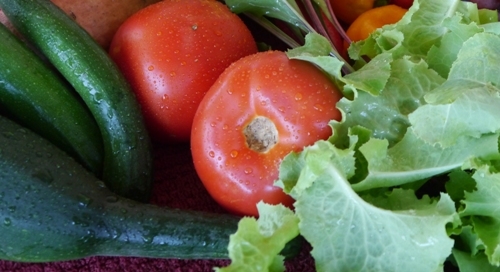 Do your veggies look like this? By Carolyn Shearlock, author of The Boat Galley, with over 350 FREE articles to get the most out of your boat kitchen with galley tips, insights & equipment recommendations. A few recipes, too - plus an active Facebook community to ask questions and share tips with other readers! The print edition of The Boat Galley Cookbook, written with Jan Irons, is now available from Amazon and Barnes & Noble. 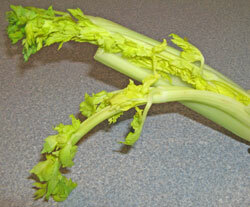 Do you have droopy celery? Rubbery carrots? Squishy potatoes? Think you need to throw them out? Don't! Last week, the column was all about what to do in restricted visibility when you couldn’t see the other vessel but you could hear her. But what did you hear and what is it broadcasting – and do you know how to broadcast your status as well…? Toot-Toot, Beep-Beep, Oh how I wish I knew what they were telling me. Stay alive with Rule 35! 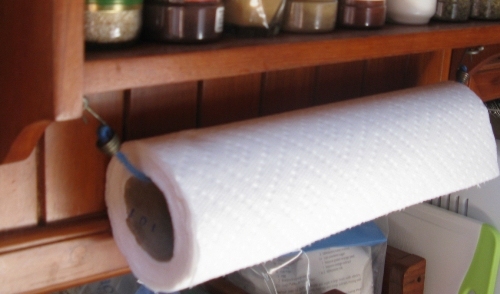 Would you do this with the dishrag you've been using for over a week? 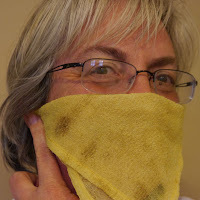 A Dishrag That Doesn’t Get Stinky! It's the first full weekend of fall, and a big weekend for boat shows, with nautical events in California, New York, Florida and all around the world. This column is, like last week’s, a “two-fer.” Rule 34 is about what are the proper maneuvering and warning signals – how to communicate in the absence of radio or voice signals. Rule 33 is what equipment specifications are necessary to send those signals in a consistent way. I am going to emphasize the Inland aspects of these Rules – for obvious reasons! Carolyn Shearlock, author of The Boat Galley, appears weekly on the Daily Boater with tips for getting the most out of your boat's kitchen. Download a free sample of her soon-to-be-published The Boat Galley Cookbook. It's the first weekend of fall, and a big weekend for boat shows, with nautical events in Southampton, Vancouver, Monaco, Missouri and more. 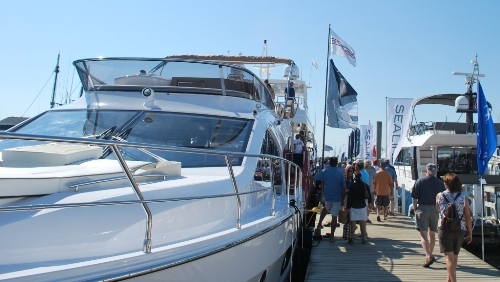 Here in our home state of Connecticut, Thursday was the first day of the Norwalk Boat Show, the last in-water boat show of the year in New England. 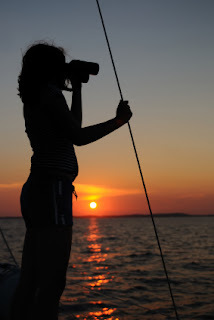 For the latest installment of the Daily Boater's weekly Marine Product Review, Mark Sutton of MarineProductReviews.com put the Tahiti Waterproof 7x50 Binoculars from West Marine to the test. This is my favorite type of idea: it's cheap, easy and solves a bunch of problems that expensive "solutions" don't! If you missed it, and you're near us in the Northeast, there’s still one more in-water show in New England starting in a few days – the Norwalk Boat Show will have a lot of the same exhibitors as Newport, plus some local CT and NY vendors who skipped Newport this year. There will be hundreds of boats in the water and on land and lots of great accessories (including Boat Name Gear!) 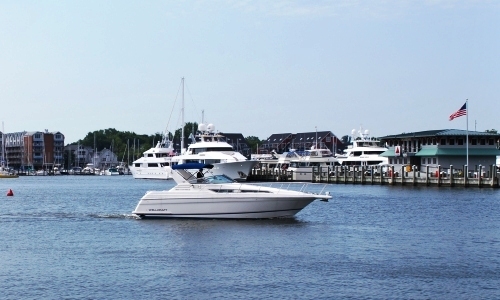 For more info about Norwalk, visit BoatShowNorwalk.com.